Following the bubonic plague outbreak in Florence in 1348, a renewed religious conservatism marked the general atmosphere and the next generation of artists. Nardo di Cione and his two brothers were among the leaders of this medievalizing style, which harked back to models of presentation antedating the naturalistic and humanistic innovations of Giotto. The enduring, iconic quality of Nardo’s Madonna and Child is a product of his interpretation of the Virgin as the Queen of Heaven, set against an abstract and timeless gold background in the Byzantine tradition. The artist’s own lyricism is evident in the delicate skin tones, rhythmic and ornamental draperies, and rich, saturated palette. 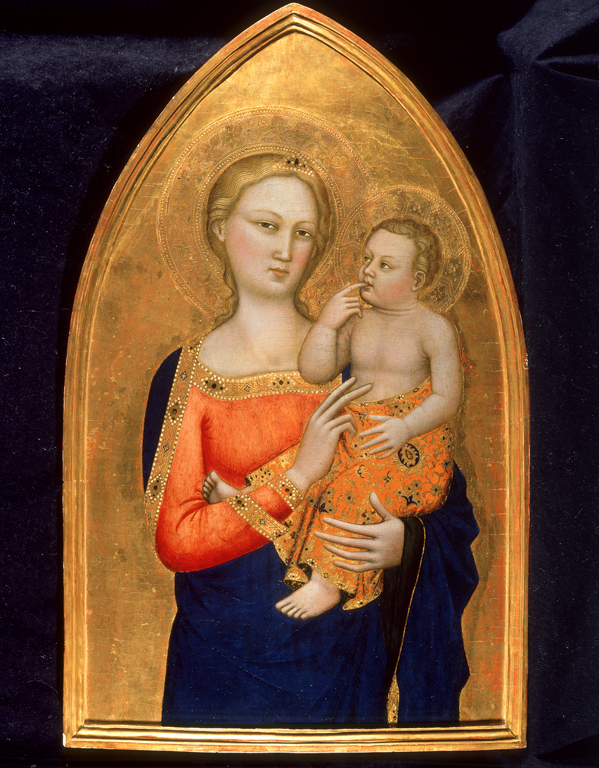 The painting likely served as the central panel of a small folding altarpiece. Sawinski, Catherine. From the Collection--Virgin and Child by Nardo di Cione. Milwaukee Art Museum: Under the Wings, December 17, 2013. http://blog.mam.org/2013/12/17/from-the-collection-virgin-and-child-by-nardo-di-cione/. Andera, Margaret, Nonie Gadsden, Britt Salvesen, and Laurie Winters. Collection Guide: Milwaukee Art Museum. Milwaukee, Wisconsin: Milwaukee Art Museum, 2004, pp. 12 and 67 and back cover, cat. 8, color illus. p. 12 and back cover. Milwaukee Journal Sentinel, December 19, 1995, p. 8B, illus. Cue Section p. 1. Sotheby's, July 10, 1968 [auction catalogue]. London: Sotheby's, 1968, p. 24, lot 27, b/w illus. p. 25. Offner, Richard. A Critical and Historical Corpus of Florentine Painting. Section IV, vol. II. New York: College of Fine Arts, New York University, 1960, p. 83–84, pl. XXV (as Following of Nardo di Cione). Recent Acquisitions, Milwaukee Art Museum, June 7–August 18, 1996.